The Indian Heritage and Cultural Association (IHCA) of New Jersey that is synonymous with Natya Darpan wrapped up yet another year of successful theater events. Known for its short multi-lingual play festival, IHCA showcased 6 plays this year covering a variety of subjects. This year there were 3 Marathi, 2 Hindi and 1 English-Bengali play by local award-winning actors and diverse groups from the Indian-American community. The six plays were selected by a panel from more than 28 entries, based on its content which organizers said was exceptional and thought provoking, whether it dealt with social issues of human emotions. More than 73 local artists took part in the performances. “All in all, this has left an immense mark on the audience, who kept wanting for more,” IHCA said in a press release. Held at the Middlesex County College, Natya Darpan 2019 attracted a lot of mainstream audiences, organizers said, with each event sold out in advance. The Governor of New Jersey sent a special letter to IHCA congratulating the organization on the Natya Darpan Festival. At the inaugural lamp-lighting ceremony, guests included Padma Shri Dr. Mohan Agashe, Dr Farley Richmond, professor of the Department of Theatre and Film Studies at the University of Georgia, Consul General of India in New York Sandeep Chakravorty, Deputy Consul General Shatrughan Sinha, Edison Council President Ajay Patil, Edison Councilman Joe Coyle, Mayor of West Windsor Hemant Marathe, Mayor of Woodbridge John McCormac, Isha Vyas, head of the Division of Arts and History Programs & Services at Middlesex County Office of Culture and Heritage, and Kevin Dalina of Middlesex County College. The guests applauded the efforts of IHCA, an organization that aims at promoting local talent and bringing communities together through the performing arts. It’s focus is on social issues such as women’s empowerment, human trafficking, immigration, LGBTQA+ communities advancement, community relationships, mental illness and more. 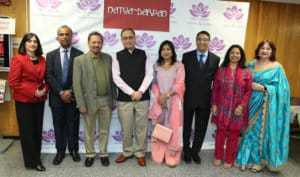 Founded by Dr. Ashok Chaudhary, Natya Darpan has received an overwhelming response from the tri-state audience over the last few years and this year was no different, organizers said. The IHCA and Natya Darpan have been supported by several local organizations and renowned personalities from film, TV and theater, including Agashe, Dilip Prabhavalkar, Archana Joglekar, Umesh Kulkarni, Bharti Achrekar, Atul Parchure, Padmashri Satish Alekar, Vijay Kadam and Yogesh Soman and more, the press release said. The advisory board comprises of individuals who have made a mark in their professions, including Professor Richmond, director Ashok Vanjari, Dr. Meena Nerurkar, actor-director Ashok Kamerkar, Nutan Kalamdani, founder and managing director of Awesome Internet Television, and actor-director Dr. Dipan Ray. The Middlesex County Board of Chosen Freeholders and the Consulate General of India in New York have also supported IHCA & Natya Darpan, the press release said. “With our sincere efforts and lot of hard work, we are inching close to our dreams and goals. We also welcome support from those who would be interested in joining our organization,” Chaudhary is quoted saying in the press release.